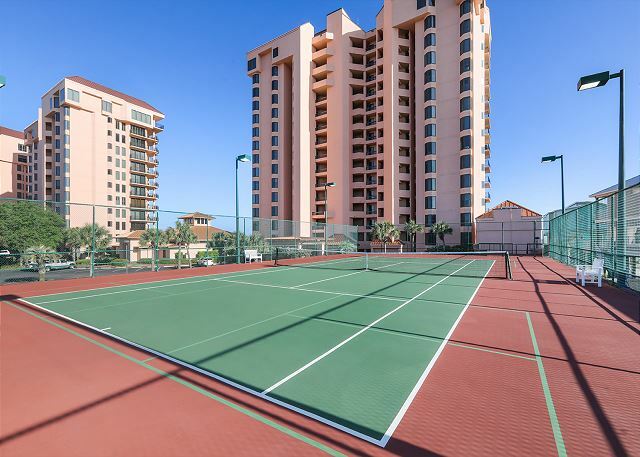 Decorated with a comfortable “coastal cottage” flair, this 1342 sq ft, 2 bedroom / 2 bath condo features extraordinary panoramic views of the Gulf and the Center pool complex from the living room and master bedroom. Close to all our amenities, it’s wonderfully suited for a family vacation. And free wireless internet makes it the perfect place for a working vacation. The well-stocked kitchen and laundry area are fully equipped, including a full size washer and dryer. Other features include wet bar with ice maker, 9 foot ceilings throughout, ceiling fans, central heating and air conditioning, and a large master bath with whirlpool tub, separate glass enclosed shower, double vanity and lots of closet space. Our stay was nice minus the worry about hurricane Michael. The rental is nice and we enjoyed the ice maker in the room especially when we were going to the beach and pool. The toilets ran constantly and there was some extra cleaning that could’ve been done but the condo was well furnished and had plenty of room for our family of 5. Pool was a little chilly and hard to swim in and could be used to be heated a little but they have an indoor pool as well that is heated. Thank you for choosing the Aronov Gulf Coast team for your SeaChase reservation. We appreciate your feedback and will pass it on to the condo owner; we'll also make sure housekeeping and maintenance are aware of the issues. We hope to see you at SeaChase again soon! Amazing! Looking forward to staying again in0203C. Perfect location and what made it more pleasant was having an ice machine in the room. If possible, would suggest allowing small pets and adding a pet fee for the time renters are staying. Thank you for choosing the Aronov Gulf Coast team for your SeaChase reservation! We're so glad you enjoyed your stay with us and hope to see you again soon. Unfortunately, we do not have the option of allowing pets. The SeaChase Owner's Association bylaws do not allow pets in any of the rental condos. Very nice experience like always. Very nice room! Was equipped with everything a person would need to vacation there. Wonderful, we're glad you enjoyed your stay! Our vacation rental experience could not have been more perfect. Seachase is in a great location and has a beautiful view of the gulf. Location location location! Close to everything but once you step on the beautiful beach you would never know town is just on the other side of the condo. Tranquility and peace on the beach. Great place to stay! Very family oriented! The room suites a family of 5 very well. All necessary items are available. The grounds are very well kept and security is definitely present. Close to grocery and entertainment. We go every year.